Demand for decorative tile in the US is forecast to increase 2.4% annually through 2023 to 4.1 billion square feet. Gains will be driven by growth in the number of home renovation projects, especially of kitchens and bathrooms, as these rooms commonly use decorative tile. Additionally, increased commercial improvement and repair spending will support demand growth, as it generates demand for decorative tile through the retrofitting of existing structures and the addition of new space to existing buildings. The continued efforts of builders to make their homes more marketable through the addition of large kitchens and multiple bathrooms will further drive gains. Ceramic is expected to remain the most popular decorative tile product through 2023, accounting for two-thirds of all demand gains in volume terms. Ceramic tile will remain popular in both residential and commercial applications due to its affordability and low maintenance requirements. Ceramic tile is available in a wide array of colors and surface textures, and will continue to be used by many homebuilders and commercial architects to create inexpensive floors, walls, and other surfaces. Porcelain tile demand is expected to grow at the fastest pace of any major product type through 2023 due to its scratch and stain-resistance and ability to mimic the appearance of more expensive hardwood and natural stone tile. Additionally spurring demand growth will be the increased adoption of thin porcelain tile (TPT), as its larger size, light weight, and damage resistance makes it well suited for use in both residential and commercial applications. Flooring is expected to account for the vast majority of decorative tile demand gains through 2023. In the residential market, gains will be supported by continued consumer interest in tile flooring in kitchens, bathrooms, dining rooms, and foyers because of its aesthetic appeal and functionality. In commercial applications, demand will be bolstered by its specification by architects and building managers because of tile’s durability, low maintenance requirements, and slip resistance. 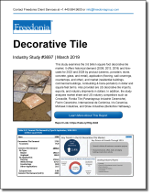 This Freedonia study analyzes the US decorative tile market. It presents historical demand (2008, 2013, 2018) and forecasts for 2023 and 2028 by product (ceramic, porcelain, stone, and other), application (flooring, wall coverings, countertops, and other), and market (residential buildings, commercial buildings, nonbuilding and transportation) in current dollar and square foot terms. Also provided are US decorative tile imports, exports, and industry shipments in dollars. In addition, the study analyzes company market share for competitors such as Crossville, Florida Tile, Iris Ceramic, Mohawk Industries, and Shaw Industries.